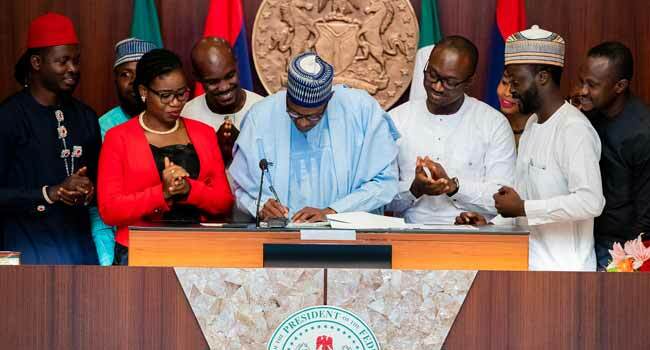 President Muhammadu Buhari has accented to the ‘Not Too Young to Run’ bill. The signing on Thursday took place at the Council Chambers of the Presidential Villa in Abuja, the nation’s capital. 1. First, I would like to welcome you all to the State House. Today is a significant day for all of us in Nigeria, and most especially our young people – and the role they play in our democracy, politics and national life. 2. We are gathered here for the signing of the “Not Too Young To Run Bill”, a landmark piece of legislation that was conceived, championed and accomplished by young Nigerians. 3. The coordinators of the Not Too Young To Run movement have now established a formidable legacy – which is that, in our maturing democracy, if you really want to change something in Nigeria, and if you can organise yourselves and work hard towards it – you can achieve it. The outcome of such efforts is this remarkable feat. 4. These efforts have resulted in the heroic task of enshrining in law, a reduction of the minimum ages for elective office in Nigeria. c. Eligible age for aspirants for Office of the President, will be lowered from 40 to 35 years. 5. Surprisingly, the age limits for Senators and Governors was not reduced, as originally proposed by the sponsors of this Bill. This is an issue that may need to be addressed going forward. 6. Nevertheless, your focus and contributions have now successfully increased the quality and maturity of Nigerian democracy and expanded the playing field for youth participation in politics. 7. You, the young people of Nigeria, are now set to leave your mark on the political space, just as you have done over the decades in entrepreneurship, sports, art, media entertainment, technology, and several other fields. 8. You are undoubtedly Nigeria’s most important resource – not oil, not agriculture, not solid minerals – but you and all of us. Your energy, intelligence and talent are what will drive and develop Nigeria, long after we are all gone. 9. This is an opportunity for me to affirm that this Administration will continue to do everything in its power to make Nigeria work for you. 10. You may all know that the Bill I just assented now becomes an Act of the National Assembly. 11. Thus, it may be tempting for you to think of this as the end of the journey. However, it is only the beginning; there is still a lot of work ahead, towards ensuring that young people take full advantage of the opportunities provided not only by this constitutional amendment but also through Nigeria’s boundless prospects. 12. You should inculcate the spirit of self-help. Those who complete their training should not just sit down and wait for government or private sector to employ them. You should be innovative and turn your hands to any legitimate work that will enable you to sustain yourself. 13. You may have noticed already that every one of you represents one of our 36 States and the Federal Capital Territory. This is because today is about preparing for the bright future of our country. 14. I am confident each one of you will transform Nigeria in your own way – whether through media, agricultural enterprise, economists, engineers, or as lawmakers in your States or at Federal levels, or as State Governors – and even someday, as President. Why not? But please, can I ask you to postpone your campaigns till after the 2019 elections! 15. Finally, let me say how proud I am, and how proud the entire country is, of what you have accomplished. Congratulations and best of luck with continuing to work to make Nigeria a greater country for us and future generations of Nigerians. 16. God bless all the young people of Nigeria and God bless the Federal Republic of Nigeria.